The Graphic Arts Building, after an approval in 2005 for the redevelopment, currently houses the Graphic Arts Lofts (formerly Park University). It is an eight story, 58 unit, reinforced concrete building in downtown Kansas City, Missouri. The building was built in 1915 as a headquarters for commercial printing and related trades. The building's architect, Samuel B. The Hotel President, is a historic hotel in Kansas City, Missouri. It is now operated as part of the Hilton Hotels Corporation. The Hotel President was constructed during the same construction boom that brought Kansas City many other great structures, including the nearby Mainstreet Theater, Midland Theatre, and Kansas City Power and Light Building. The hotel was completed in 1926. The Kansas City Power and Light Building (also called the "KCP&L Building" and the "Power & Light Building") is a landmark skyscraper located in Downtown Kansas City, Missouri. 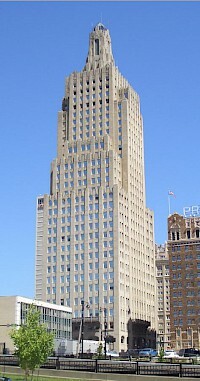 Construction was completed in 1931, as a way to promote new jobs in Downtown, and since then, the Art Deco Kansas City Power and Light Building has been a prominent part of the Kansas City skyline.